Video Poker is one of the simplest casino games to learn and play, but it's also the game that gives you the best chance of winning. 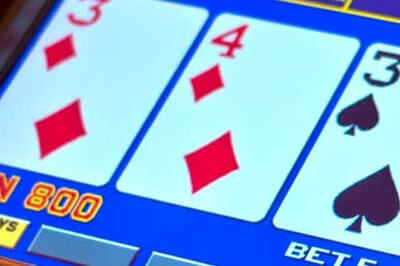 In fact, certain Video Poker games have an expected 'return to player' of over 100%, meaning that - for once! - the edge doesn't favour the house. 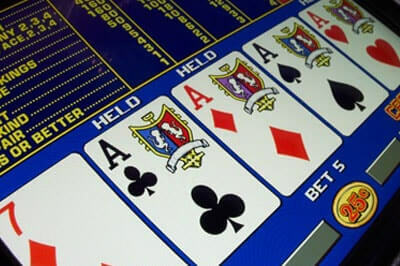 Introduced into land-based casinos in the 1970s, Video Poker was designed to take advantage of the new wave of video terminals with a game familiar to most gamblers. With the advent of online casinos, Video Poker has grown massively in popularity, as it's ideal for that setting - there's no need for dealers, balls, dice or physical cards. New varieties of Video Poker are being devised all the time. We run through some of the most popular variants below. But this guide is designed around the most popular Video Poker game - Jacks or Better. Once you're familiar with the mechanics of Jacks or Better (the gameplay, payouts and strategy) you can adapt your playing style in subtle ways to suit each variation. This Video Poker guide is designed to take you through the basics of the game, showing you how to bet and select your hand. We also explain a basic Video Poker strategy that will stand you in good stead for most games, and even allow you to practice for FREE until you're familiar enough with the game to want to play for real money! The player Holds from 1 to 5 of those cards. The player Draws 1 to 5 new cards. If the player's hand appears on the paytable, the player wins. We walk you through a typical game below under 'Playing the game'. A winning hand is paid out based on its ranking on the paytable - the better the hand, the higher the payout. As with all poker games, the highest possible hand (and therefore the highest payout) is the Royal Flush (10, J, Q, K, A of the same suit). Get this hand and you'll earn the biggest payout possible. But remember - all you need to do is get a winning hand, and that can be as low as a pair of Jacks. The first major decision you have to make when playing Video Poker is how much you want to bet on each hand. There are two elements involved in this - the coin size and the number of coins. Both of these can be adjusted by the player. Each game has different coin sizes, ranging from 1c to &dollar;10. The range of coin sizes available to the player is an important factor in choosing the right table. In the image to the right, the player has chosen a coin size of 25c. On each deal, you can choose to bet from 1 to 5 coins. If you look back at the Paytable, you'll see that the highest payout in Video Poker comes from hitting a Royal Flush when playing 5 coins. For this reason, you should always play five coins per hand, as the player has in this instance. This is why you need to choose your tables wisely - there's no point playing a &dollar;10 coin if your budget will only allow you to play one coin at a time! So lower your starting stakes and play the maximum coins per hand. Once you've placed your bet, you're ready to play! Simply click the 'Deal' button and you'll be dealt five cards, face up. At this point, you need to start making choices. Use your knowledge of Poker hands along with an awareness of the Paytable to choose which cards to keep and which to discard in order to stand the best chance of getting a winning hand. The choices you make here will give you your best chance of winning - or ruin your chances completely! Remember, Video Poker is all about maths and probability, there's no psychology needed. We'll say it again: all you need is a winning hand. Fortunately, there's a cast iron method to choosing which cards to hold, and we cover it in great detail in our Video Poker optimal strategy guide. Please read it before you start to play - it could save you a lot of money! Using the optimal strategy, select which cards you wish to keep. You can do this in most games by simply clicking on the card itself. Other games display a 'Hold' button underneath each card. In the example displayed here, the player has been dealt three Jacks, giving him an easy choice! He simply selects the three Jacks, each of which then shows a Held symbol. In some games, the process is even simpler as the best cards are automatically held for you! Once you're happy with your chosen cards, simply click 'Deal' again (NB on some games, the 'Deal' button changes to 'Draw' but it does the same job!). At this point, any cards not held are returned to the pack. You're now dealt new cards, based on how many you held e.g. if you held 2, you'll get three more; if you held 4, you'll get 1 new one. In the example here, the player has been dealt an eight and a seven to go with the three Jacks. In this case, the new cards don't add to the hand, but the player still has the Three of a Kind that was first dealt. In the example above, the player qualifies for a payout. Playing five coins means that the payout for Three of a Kind is 15 to 1, so the return to the player is &dollar;3.75. If you were playing a multihand game, the payout could be different for each separate line. This is explained in detail below. 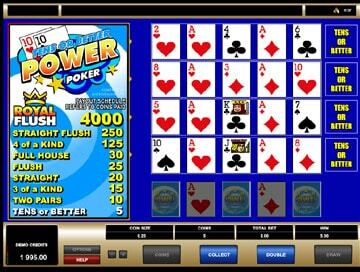 As Video Poker has grown in popularity, players have started to look for more excitement on each bet. 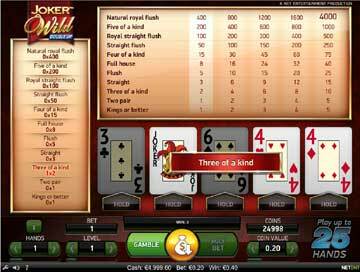 Casinos have responded by allowing players to bet on multiple lines at once. The number of possible lines ranges from 4, through 10, 25, and 50, right up to 100! The game 'mechanics' stay the same as for a single line game, i.e. your betting decisions affect ALL lines. This offers a great way for players to maximise their wins. Any guaranteed win will count on all lines and has a chance of being improved on each of them. An important factor to note here is that on multihand games, each line is treated as a separate bet and cards are dealt from an individual deck of cards, one per line. This explains why you sometimes receive the same card in two or more hands. In the example shown here, the player has held 2 Kings. As they're playing 10 lines, each of the 10 lines has a Pair of Kings and receives three new cards. Each separate line is guaranteed to be at least a pair of Jacks or Better, but some turn into Three of a Kinds and Two Pairs. This is when playing multiple hands comes into its own - every hand is a winner. The downside, of course, is when you get a poor hand on the Deal or Draw, in which case you end up losing multiple times. The decision to play multiple hands or not is an important part of your personal Video Poker strategy. When playing multiline games, it's especially important to manage your bankroll. Although you're still only betting 25c per line, at 5 coins per line and 100 hands per bet, each bet will cost you &dollar;125! Keeping to the 5 coin per line guideline, it would be better to reduce the coin size and / or the number of lines to keep each bet within your limits. Video Poker games fall into two 'families' - Jacks or Better, and Deuces Wild. Jacks or Better is the most common and is the best game to learn for new players as the optimal strategy forms the basis of most variations. We recommend getting familar with Jacks or Better and its strategy for a while before being tempted by the more 'exotic' variations, but we've included a brief description of some of the more common ones below, to whet your appetite! Tens or Better - win with a pair of 10s or higher. Aces and Faces - get a higher payout for any 'Four of a Kind' featuring Jacks, Queens or Kings and an even bigger payout for a hand of four Aces. Deuces Wild - 2s are wild and can be substituted for any other card to form a winning hand. Joker Poker - a Joker is added to the 52-card deck and can be substituted for any other card to form a winning hand. Also allows for a Five of a Kind! 2 Ways Royal - you have two ways to make a Royal Flush and claim the highest payout; not just 10, J, Q, K, A, but 2, 3, 4, 5, 6 too. A basic Video Poker strategy for use on Jacks or Better type games - the most popular and frequently available version of the game. This basic Video Poker strategy is easy to learn, and will get you up and playing in as short a time as possible. As you move on to the more 'exotic' versions of Video Poker, this basic strategy can easily be amended with a couple of tweaks to ensure you get the maximum payout from each type of game.